A couple years back, I was invited to a group show with the Killer Next Door art collective based on painting on nothing but records (not a new concept but a fun one when you have lots of records! )...it was called simply "12 Inches" and each artist got to grab some records from one guy's collection and paint them or make art out of them. some bubbled, some rang out presidential song lyrics, some depicted surreal scenes. The "12 Inches" flyer from the show at the old KND studio! I have returned to painting records because about a year ago, one of my cousins filled the trunk of my car with them. Different shapes and sizes, even some in different colors. Here are a few new ones I have added to my Etsy store- get them here. I am a fan of Will Cotton's candy landscapes and incorporating the candy with the little frogs and lizards was fun! My earlier record paintings covered the entire records but a few did not have many (if any) scratches and looked great with the black exposed. And there was a red record in the stash! The green critter on it is an Oleander Hawk Moth. 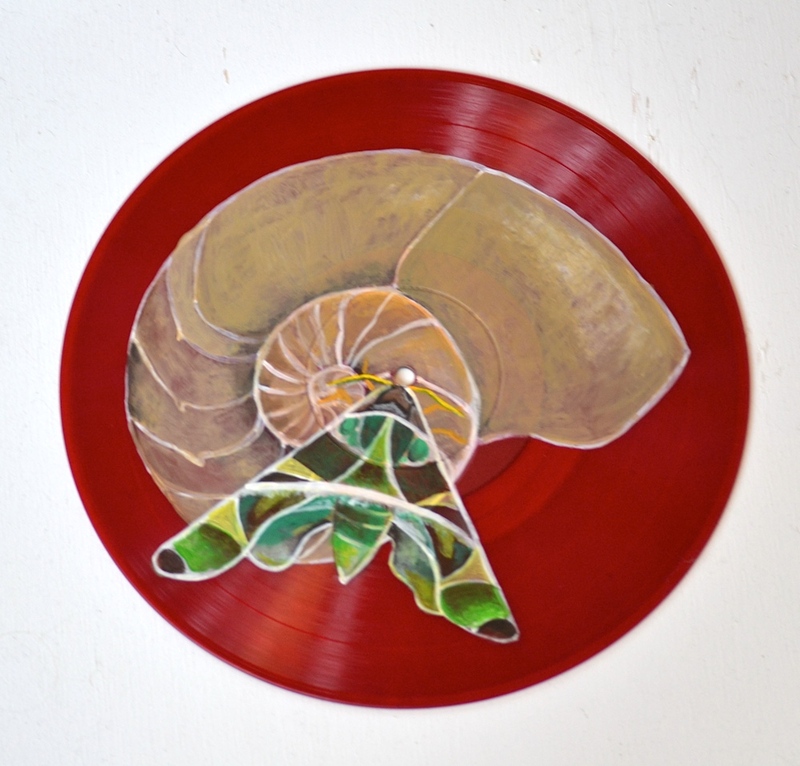 I am accepting holiday commissions on a variety of surfaces (including records). If you have an idea for something you would like for a special gift, email me and let's talk art!